Lineage. Organized as 105th Aero Squadron on 27 Aug 1917. Demobilized on 8 May 1919. Reconstituted and consolidated (1936) with 136th Squadron which, having been allotted to the TN National Guard, was organized on 4 Dec 1921. 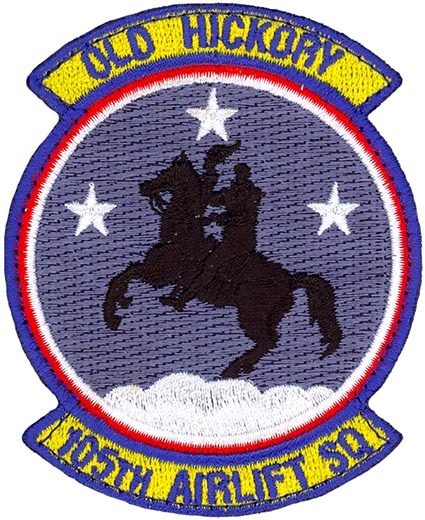 Redesignated 136th Observation Squadron on 25 Jan 1923; 105th Observation Squadron in 1923. Ordered to active service on 16 Sep 1940. Redesignated 105th Observation Squadron (Medium) on 13 Jan 1942; 105th Observation Squadron on 4 Jul 1942; Inactivated on 18 Oct 1942; Activated on 1 Mar 1943; Redesignated 105th Reconnaissance Squadron (Bombardment) on 2 Apr 1943; Disbanded on 15 Aug 1943; Reconstituted on 21 Jun 1945; Redesignated 105th Fighter Squadron, and allotted to Tennessee ANG, on 24 May 1946; 105th Fighter Squadron extended federal recognition on 3 Feb 1947. Redesignated 105th Fighter Interceptor Squadron on 1 May 1951; 105th Tactical Reconnaissance Squadron on 1 Dec 1952; 105th Air Transport Squadron on 1 Apr 1961; 105th Military Airlift Squadron on 1 Jan 1966; 105th Tactical Airlift Squadron on 26 Mar 1971; 105th Airlift Squadron on 15 Mar 1992-present. Assignments. Unkn, 27 Ag-Dec 1917; Air Service Supply Depot No 1, Dec 1917; Air Service Production Center No 2, Nov 1918; Air Service Spares Depot, c. Jan c. Mar 1919; Unkn, c. Mar-8May 1919. TN National Guard, 4 Dec 1921 (divisional aviation, 30th Division); Forth Corps Area, 16 Sep 1940; First Army, 3 Oct 1940; I Army Corps, c. Nov 1940; 65th Observation Group, 1 Sep 1941-18 Oct 1942. 65th Observation (later Reconnaissance) Group, 1 Mar-15 Aug 1943. Tennessee Air National Guard, 24 May 1946. 118th Fighter Group, 1947; 118th Tactical Reconnaissance Wing, 1952; 118th Air Transport Wing, 1961; 118th Military Airlift Wing, 1966; 118th Tactical Airlift Wing, 1971; 118th Airlift Wing, 1992-present. Stations. Kelly Field, TX, 27 Aug 1917; Garden City, NY, 4–23 Nov 1917; Winchester, England, 8–23 Dec 1917; Clichy, France, 27 Dec 1917; Romorantin, France, 21 Nov 1918; Chatenay-sur-Seine, France, c. Jan-c. Mar 1919; Mitchel Field, NY, c. 27 Apr-8 May 1919; Blackwood Field, Old Hickory, TN, 4 Dec 1921; McConnell Field, TN, 1927; Memphis Mun Aprt, TN, Nov 1930; McConnell Field, TN, Apr 1931; Sky Harbor Aprt, TN, 1932; Berry Field, TN, c. Mar 1937; Lexington County Aprt, SC, 24 Sep 1940; Langley Field, VA, 26 Dec 1941; (Operated from Cherry Point Marine Corps Airfield, NC, 28 Apr-12 May 1942; Georgetown Marine Corps Airfield (OLF), SC, 24 May 1942; Charleston AAF, SC, 29 Aug 1942; Birmingham Aprt, AL, 18 Oct 1942; Columbia AAB, SC, 1 March 1943; Florence AAF, SC, 12 Apr-15 Aug 1943; Berry Field ANG Base 3 Feb 1947–present. McGhee Tyson Aprt, 1 Jun 1952-1 Dec 1952. Aircraft. JN-4, TW-3, PT-1, BT-1, 0-2, 0-11, O-17, 1921-1933; O-38, c. 1932-1935; O-25, c. 1935-1938; O-38, c. 1938-1941; O-47, c. 1939-1942; O-52, 1941–1942; B-10, 1942; O-46, 1942; O-49, 1941-1942; O-57, 1941-1942; B-25, 1943; P-47D, 1947–1951; F-51D, 1951–1952; F-82F, 1951; RF-51D, 1952-1954; RF-80A, 1954-1961; C-97G, 1961-1967; C-124C, 1967-1971; C-130A, 1971-1990; C-130H, 1990–present. Operations. Supply Unit, 1917-1919. Emergency operations while under state control included flood relief in central Mississippi Valley, Jan 1937. Antisubmarine patrols, c. Dec 1941-Oct 1942. Replacement trainng, Apr-Aug 1943. Korean War call-up. Service Streamers. Theater of Operations. Campaign Streamers. Antisubmarine, American Theater. Emblem. Approved on 9 Mar 1954.